Cunard's Queen Victoria is based upon a modified platform similar to that of Holland America Line's Vista-class ships. Photo courtesy of Cunard. 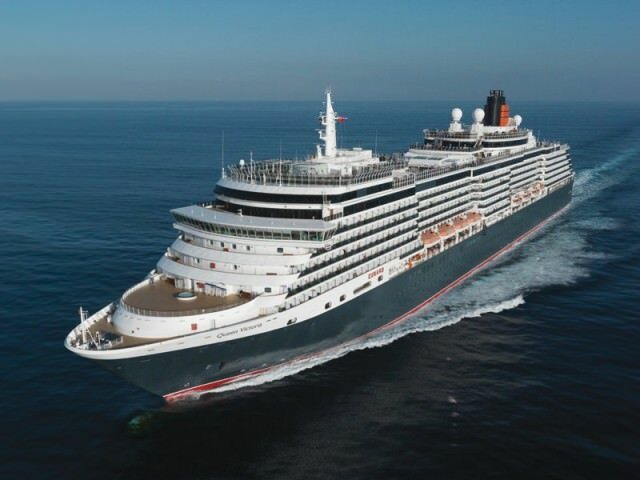 The 2,014-passenger Queen Victoria debuted in 2007 and near-sister Queen Elizabeth followed in 2010. 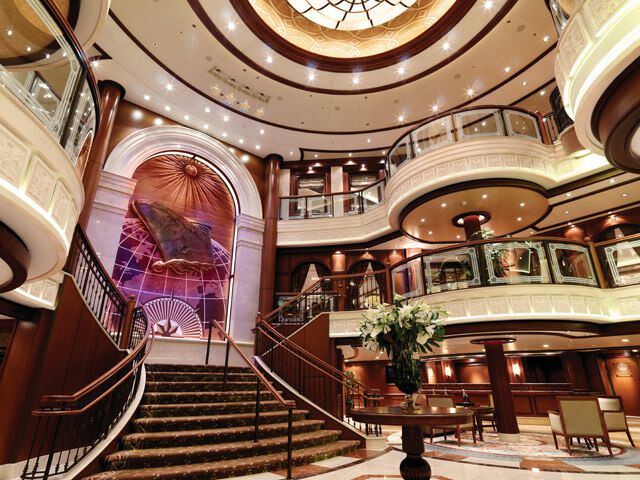 The handsome Queen Victoria sports Cunard’s traditional black-and-red hull and grand interior spaces. A smaller, somewhat quieter version of the QM2, the Queen Victoria also marries tradition with modern technology, design and innovation. Aboard Queen Victoria, for instance, an unusual show lounge arrangement invites guests to reserve in advance private box seats in the theater for special performances. 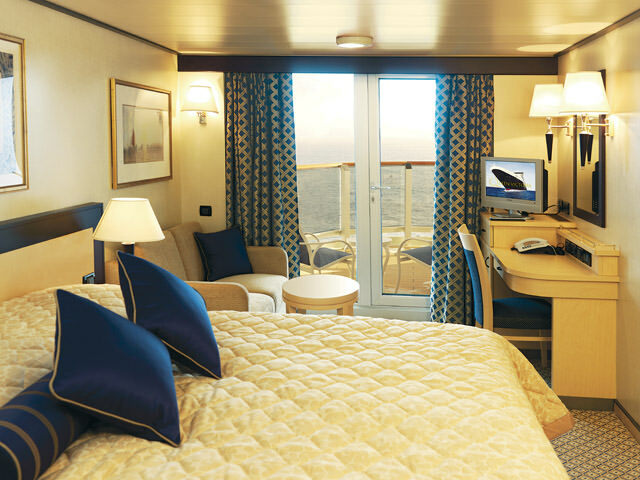 Everything onboard Queen Victoria boasts a decidedly British feel. Photo courtesy of Cunard. The ship’s class system means Queens Grill and Princess Grill diners have an exclusive restaurant, lounge and outdoor sunning areas reserved just for them. 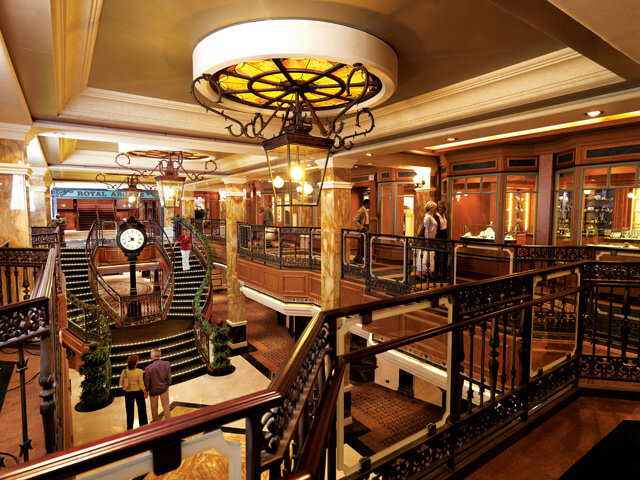 Like QM2, Queen Victoria also has a casual lido buffet, plus the cozy Todd English restaurant ($20 for lunch and $30 for dinner). The grand Britannia Restaurant is where the majority of guests dine, many of them after dinner moving on to the gorgeous Queens Room with inlaid wood floor. The many other lounges and pubs include the classy nautical-style Chart Room and Golden Lion Pub. The library is among the best at sea and also guests always enjoy the ship’s permanent collections of Cunard and maritime photos and memorabilia. You’ll find a forward-facing gym and spa, plus an indoor/outdoor play area for kids, several pools and hot tubs. Near the main pool, Queen Victoria also offers the lovely Winter Garden, an old-time space with rattan furniture, ceiling fans and a fountain. Outdoor activities include paddle tennis, quoits and golf putting or a stroll around the expansive, wrap-around promenade deck. Queen Victoria has staterooms to suit every taste and budget, like these attractive balcony staterooms. Photo courtesy of Cunard. Princess and Queens Grills suites guests are privy to even more of course, from a pillow menu to concierge service, shoe shine service, a separate bath and shower, a larger sitting area, and a full bottle of sparkling wine upon embarkation. Queens Grill guests are on the receiving end of complimentary daily canapés, fruit basket, butler service, and sugar-iced strawberries to go along with a bottle of champagne upon embarkation. The Duchess of Cornwall. Camilla, as she is more commonly known, dispatched a bottle of bubbly against the hull of the new vessel and launched Queen Victoria into service. To truly get the feeling of what it is like to be aboard Cunard Line’s new Queen Victoria, it helps if you think of hats. Hats crowned nearly every woman’s head during Queen Victoria’s naming ceremony in Southampton, England this past December. Read more . . .